Most people that know me would say that I am creative and I would agree. I am a potter, a seamstress, and a writer. I knit every day. But even with all of that, there are times when creativity is stifled by fear. I remember taking a sculpture class at the museum. At first, I fell right into it. We were using clay–my primary medium–an old friend. My teacher was very complimentary; who doesn’t respond to that? I basked in a sense of accomplishment. And then one day we went up to the gallery to do some sketches prior to sculpting. I sat before a pensive 10th century Buddha. Nothing–I was paralyzed. How could I draw anything? That wasn’t what I knew how to do. How could I meet the expectations, when compared to my work in clay this would be nothing? What was the right way? Finally the teacher came over and said, “Why haven’t you started? What’s wrong?” And I told him I didn’t know how. He laughed and said, “Of course you do. Let go and just put what you are thinking on the paper.” And I did. It wasn’t a masterpiece, but it didn’t have to be. It was the opening to the creative pathway. This came to mind a few months ago when I was at the PeerSpirit writer’s workshop on Whidbey Island. One evening early on we were given the option of doing a collage. I was skeptical. How would this help my writing? I am a potter, not a collage artist. But all of those thoughts were just rationalizations. It really boiled down to fear. How could I create a collage that would pass muster? I didn’t know how to do this. What would people think? I almost didn’t go that night but the alternative was sitting in my room twisting with recrimination. I walked over the boardwalk to Marsh House and found a table. We didn’t have hours to do the collage and there was no time for self-doubt. Within a few minutes, I plotted my course. 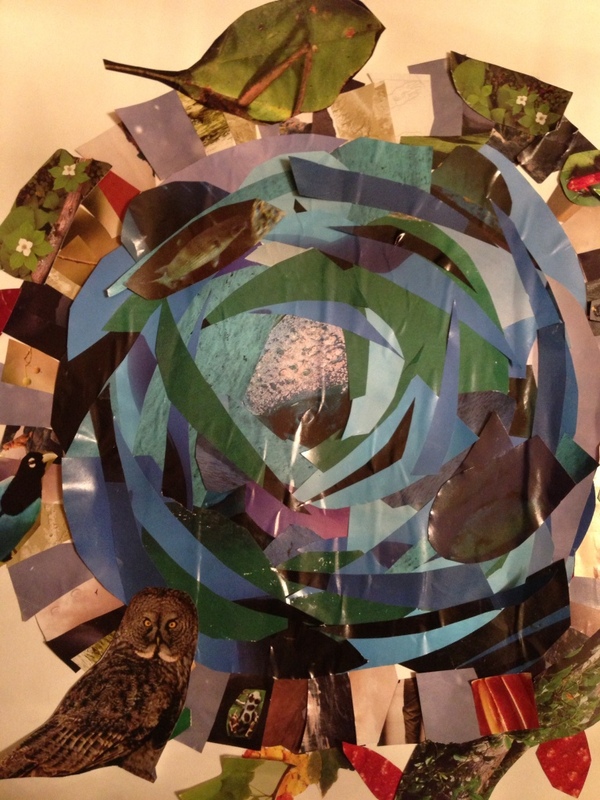 My writing project centered around the Blue Hole, the headwaters of the San Antonio River, and so would the collage. I shifted through National Geographics and old calendars, at first focusing on anything blue for the water, then beige and taupe for the stone rim. Then came birds, leaves, and branches on the edge and a filmy blue whale’s eye at the vortex. I was caught up in the creativity of the moment. The Blue Hole Collage opened my mind for the writing that was to come that week. Creativity overcame fear and I was in a new invigorating space. Bridget…I love what you have written. Thanks for sharing!